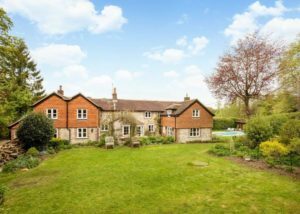 The Country House Company is delighted to be handling the sale of Sherwood Cottage situated at the edge of West Meon in Hampshire. 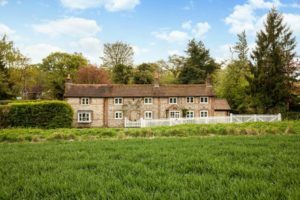 Built for the local gamekeeper circa 250 years or so ago, this pretty cottage has been sympathetically extended in recent years to offer spacious and versatile family accommodation. 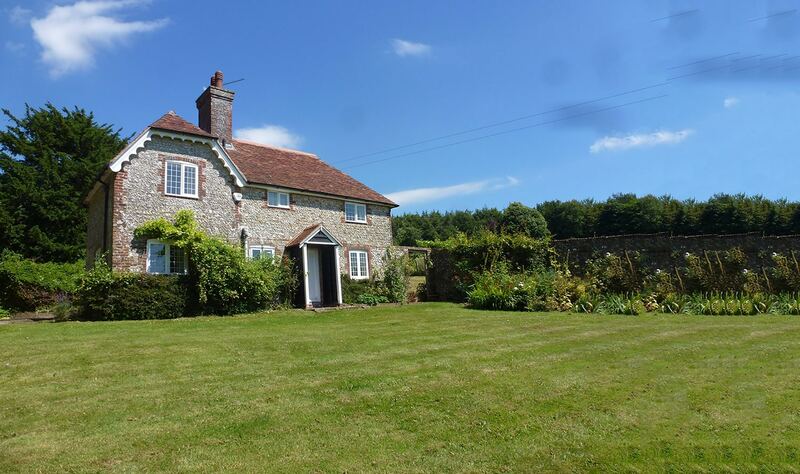 Overlooking open fields and set in well laid out mature gardens the cottage is in a small hamlet at the edge of West Meon. This attractive brick and flint extended cottage retains a delightful cottage atmosphere incorporating many of the original features yet with contemporary fittings throughout. The beamed ceiling entrance hall incorporates handmade oak cupboards and opens onto a large family room with bespoke bookcases and French doors that open to the patio and garden. Adjoining this is a newly fitted shower room with underfloor heating. This area can be closed off with the bi-fold doors to offer an en suite guest room, fifth bedroom or small granny annexe. To the side of the hall is a utility room with butlers sink, oak work surfaces and space for appliances. The spacious double aspect dining room has plenty of character with beams, fireplace and a large square bay window area with doors to the patio and window seats. The dining room links to a delightful family snug area with fireplace and is open to the bespoke kitchen installed by Beauport Kitchens. 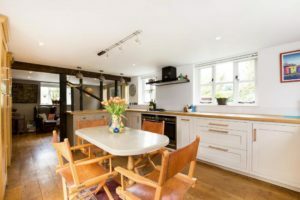 The triple aspect kitchen is fitted to a high specification with oak and quartz work surfaces and Farrow & Ball painted units, gas hob and induction hob, two ovens, plenty of room for dining and shuttered French doors to the patio and garden. The kitchen provides access to a large wine cellar. On the first floor the master bedroom is a spacious, quadruple aspect room with shuttered windows and walk in closet. The three double bedrooms are large rooms, each with different features and outlooks. There is one en suite shower room, one en suite bathroom with shower over and a family bathroom all updated with contemporary fittings and underfloor heating. The 4th bedroom/study is a small double room overlooking the rear garden. The cottage has been well planned and designed with oak flooring throughout the ground floor and two of the bedrooms, plenty of storage and cupboard space, a large cellar and loft area. The garden is secluded and private with a lovely south west facing large patio, an open lawn, mature beds, a variety of hedges and trees, a heated swimming pool with wonderful summer house that can double as an outside study room, brick pool house and raised sitting area. 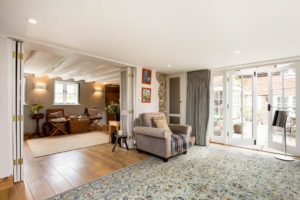 A gravelled area to the side of the cottage provides ample parking space for three cars plus there is additional parking to the front of the cottage and in front of the garage. Sherwood Cottage is on a quiet country lane looking out to fields to the front. It is in a peaceful hamlet of Lowlands just 2 miles from West Meon and has easy access to the A272 and A32 linking to Winchester, Petersfield and Alton, each with mainline stations with regular fast services to Waterloo and extensive shopping and leisure facilities and a range of excellent state and private secondary schools. The village of West Meon is a vibrant village with village post office/general store and cafe, butcher, tennis courts and a popular pub. The village primary school and preschool are a big draw to the village and there is beautiful biking, walking and riding throughout the Meon Valley and South Downs.